The 18th annual Institutional Web Management Workshop, IWMW 2014, was held at Northumbria University on 16-18th July 2014. This was a relaunch of the annual event which began in 1997: following the cessation of Jisc’s funding for UKOLN it was not clear if IWMW 2013 would be the final event for those with responsibilities for managing institutional Web services. However thanks to the support of Netskills and Cetis I was able to relaunch the event, which this year had the theme “IWMW 2.014: Rebooting the Web“. The relaunched event provided greater focus on the work which is being taken across the sector in Web management teams, with two of the morning sessions covering institutional case studies. The session on the opening afternoon provided perspectives from outside the sector and the session on looking to the future provided two talks which were based on insights provided by data associated with existing use of Web services. When significant changes to an established service such as the IWMW event are introduced it will be important to ensure that users of the service are provided with an opportunity to give their feedback on the changes, the organisation of the event, the talks and parallel sessions and the social events which aimed to provide opportunities for developing one’s professional networks. An online survey form was provided and a summary of the responses is given below. I enjoyed the Hancock museum — dinosaur, grrrr! I found the conference dinner a bit lack lustre, a bit disjointed, but hey! A few more ‘hands-on’ sessions for the more practically minded. Perhaps include a speaker or two from outside the HE domain (though ensuring content is still relevant): Ross Ferguson clearly demonstrated how ‘non-standard’ approaches can reap rewards in the HE sector. Better accommodation — my room was disgustingly dirty and the bed damaged my back. Yuck! Ouch! The food was a bit meh! too. 1. Industry speakers on general web trends and innovations -expensive and not specific to universities but it would be good to look outside. 2. Move away from discussing corporate websites and CMS to DIGITAL, the full picture, the web is everywhere. 3. Get attendee numbers up, best when more people there, more investment and promotion required….tricky I know. Others also commented that they felt the accommodation and conference dinner was disappointing (although some disagreed with this). A great opening session and excellent speaker to kick things off. Lots of opinion, good advice and the theme running throughout was nice. Lovely slides. Very relevant and interesting idea. Good practical examples too. Loved this one, Tracy really knows her stuff! I should add that an innovation this year was the final panel session in which four experienced web managers from a range of old and new universities and large and small institutions were asked to give their thoughts on the topic “What is our vision for the institutional web and can we implement that vision?” and invite feedback from the audience. Loved this, would have liked to have spent more time on it. Think it’s important that we do so we can always be pushing forward rather than just catching up. This year initially eight parallel workshop sessions lasting for 90 minutes were scheduled, but two of these were cancelled due to lack of numbers. In addition there was a 45 slot for birds-of-a-feather sessions, with the two cancelled workshop sessions being provided as birds-of-a-feather session. As ever, there is more diversity in the feedback for the parallel sessions, with some people finding the session they attend very useful but others finding them too simple; too advanced; not covering the expected area or have other reservations. Despite me being tired, boiling and having a dead battery, I found this talk by Martin Hawksey to be a true eye opener in to Google Apps Script and it’s capabilities. It was pitched at exactly the right level. Excellent session. Very well thought out structure, great interaction, great content. Good talk – interesting exercises. Will make use of this in future. Quite a few parallel sessions – would have been good to attend more than 1! It was very good, It covered something a bit basic so perhaps have more detailed descriptions of what will be covered? Very interesting session presenting the content-led aspect of the technology/content/digital workspace. Confidently and characterfully delivered. Drinks overlooked by stuffed animals… nice (especially the giraffe). I’m not averse to the odd pint; but some non-alcohol focused events might have been nice. You also need to get someone to sponsor biscuits/cakes in the coffee breaks! I attended the reception at the Great North Museum, which was perfect. Catering at Northumbria University could have been better, though it’s probably on a par with ours! Enjoyed the museum and exploring Newcastle – pleasantly surprised! Event 1: Dinner itself was very nice. The setting was a step down from previous events and I felt that the smaller tables did not lend themselves to the networking of previous years. Nominating a specific venue for after-dinner was a good move and I’m glad many attendees made it to the same location. Event 2: the museum was a lovely venue and well-situated for attendees to then move on to their own preferred activities. Conference dinner was better than expected, pub was very pleasant and walk by the river delightful. Reception at the museum was great. 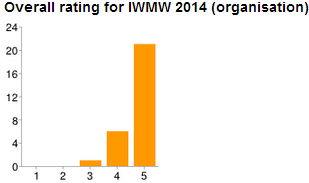 It seems clear that the IWMW 2014 event was successful. However the numbers, with 125 participants, were down slightly on last year’s event and significantly on the peak of 1997 at IWMW 2009. Those who did attend this year’s event (which included a significant number who had not attended previous IWMW events) seemed keen on continuation of the event. But if the event is to continue there will be a need to ensure that it is financially viable, which might include revisiting existing sponsorship arrangements and seeking additional sponsorship opportunities. We will also need to revisit the costs for attending the event which have remaining fixed for a number of years. There is also a need to get feedback on possible changes to the scope and format of the event. Feedback is also being solicited from those who did not attend this year’s event in order to understand the reasons for this. We are also exploring potential links with other organisations in the UK and beyond who may have interests in exploring ways of engaging with those with responsibilities for providing institutional Web services. Finally we are also looking at the ways in which support for those providing institutional Web services is being taken in other sectors. 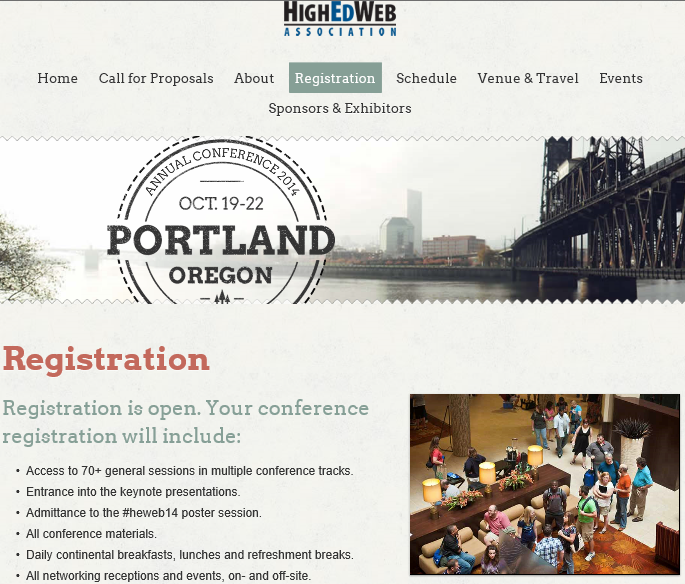 This will include an analysis of the content and format of events such as the HighEdWeb conference which is aimed at US university web managers and commercial events such as the J.Boye conferences. The HighEdWeb 2014 conference is interesting as this year’s event, which takes place on the 18-22 October 2014 , will feature six thematic session tracks, with 70+ presentations by industry leaders; pre- and post-conference half-day, add-on intensive workshops; outstanding keynotes; and a number of social and networking events. Is this an appropriate model for future IWMW events? Or should we aim to keep the event on a smaller scale which provides opportunities for informal contacts and meetings? 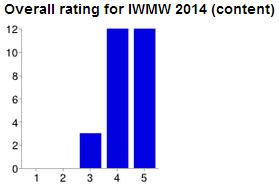 The IWMW: Planning for the Future survey form is now available. Whether you’ve attended several IWMW events, participated for the first time this year or have never attended one of the events we’d love to hear from this. This is your opportunity to help shape the future for the development of IWMW!